The ECLV Stainless Steel Electric Honey Extractor is one best to avoid. The beekeeping industry has many suppliers who are providing beekeeping equipment of varying quality. The ECLV Stainless Steel Electric Honey Extractor comes from a company that is just starting out in the production of beekeeping equipment. The company has a number of tool sets and equipment for various home and garden uses. These are however not mainly in beekeeping, but in fittings and home application. The single other notable item produced by ECLV in beekeeping is a beekeeping suit. The ECLV Stainless Steel Electric Honey Extractor is made of stainless steel and features a high speed motor which powers the extractor. It runs on 110 Volts of AC power and consumes 1.7 Amperes of electricity. Additionally, it is fitted with a speed variation control and an ON/OFF switch. The extractor can run between 5 and 100 revolutions per minute. The extractor is large enough to take shallow, medium and deep frames. 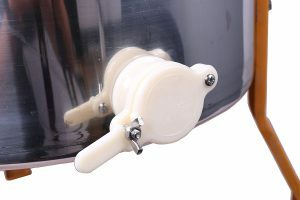 The body of the ECLV electric honey extractor is colored silver, while its legs are orange. ECLV gives you the choice of choosing between a 4 frame or a 3 frame option. 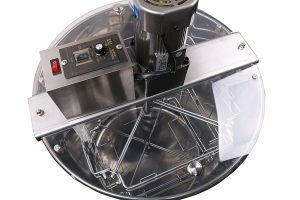 Both variants of the ECLV Stainless Steel Electric Honey Extractor are fitted with plastic lids on the sides with knobs to assist in handling. This honey extractor is shipped unassembled; though it is not difficult to put together using the common garden and home tools that most beekeepers have anyway. The 4 frame option of this honey extractor is made to an overall height of 42 inches and 21 inches width with the legs on. The inner drum diameter of is 18.5 inches. The 3 frame option on the other as the same height but a smaller width of 17 inches. Its inner drum diameter is 14.75 inches. The drum height of 23.5 inches and the weight of 14 pounds are the same for both options. ECLV has made this honey extractor with the promise of being convenient and easy to use. Beekeepers are invited to use this electric honey extractor to save time and effort. But does it live up to its promise? Let’s find out. Honey extraction is easy and fast with electric extractors fitted with a motor. It is less labor intensive than using hand-cranked honey extractors. It is safe and hygienic to use stainless steel in processes of producing human food such as honey. The extractor has a honey gate that enables you to easily empty extracted honey from the drum. The bottom of the extractor is conically shaped to allow easy draining of honey. ECLV has little institutional experience in making beekeeping products. This lack of experience is seen in this honey extractor. The honey extractor has poor construction and may even hurt beekeepers using it. The height of the honey extractor does not allow most honey collection containers used by beekeepers to go under it. Beekeepers have to remove the legs and place the extractor on a table to collect honey using a 5-gallon bucket. The honey extractor has a 1.5 meters long power cable. This length of power cable requires you to work close to your power outlet socket, or invest in additional extension cabling. The ECLV Stainless Steel Electric Honey Extractor looks good paper, but that doesn’t translate into the real world. It shows poor construction and welding. There were many unfinished edges and sharp points in the extractor that can injure beekeepers using it. There were burrs are found on the honey gate that prevented it from sealing properly, and were also burrs on the wire basket used to hold frames inside the drum of the honey extractor. Beekeepers using this honey extractor should be ready to wash lots of grease from the stainless steel drum. The legs too may not work well and may even be delivered with bends. If you are buying do decide to get this honey extractor for whatever reason, be ready with metalwork tools. There is a lot of end-user finishing that you will have to do on your own. ECLV has made a fair attempt at providing an electric honey extractor but has failed at the attempt. Professional beekeepers will find it hard to use this honey extractor. Beginner beekeepers should definitely stay away from it altogether. It may come with some parts and bits missing. Running it with these missing parts is going to give you poor results; the only way to avoid this is to get replacement parts that the company does not stock. In the inside of the ECLV Stainless Steel Electric Honey Extractor, the workings are not well aligned. On dry runs, everything may seem fine. However, the extractor delivers poor results when loaded with frames during actual honey extraction. The frames and wire basket come into contact with the sides of the stainless steel drum. The beehive frames also sometimes hit the bracket of the motor while in operation. Fixing the problems and challenges you encounter with this honey extractor is going to cost you time and money. You may also delay honey harvesting due to the weaknesses of this extractor. My recommendation is to avoid it altogether, and if you have purchased it already, then return is as soon as possible. Beekeepers should be very wary purchasing this honey extractor. The ECLV Stainless Steel Electric Honey Extractor may not deliver on its promises. Worse, it may end up injuring you during use. In place of taking a risk with your resources and possibly incurring losses in your beekeeping, it is best that beekeepers purchase other more reliable electric honey extractors. 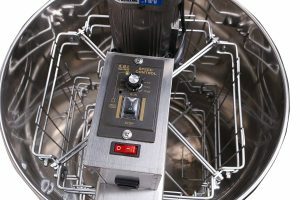 Have you ever used the ECLV Stainless Steel Electric Honey Extractor ? Leave a comment below and let us know what your experience was like.